WW2 themed comic books are a rather new phenomenon. Many authors now seem to have discovered this untapped source, so I expect this to continue for a while. In this list you will also find a few older albums, but most of it is pretty recent. I try to limit myself here to paratrooper related comics and I have excluded the WW2 aviation themed comics, because that’s a genre in its own right. Volume 3 just came out and it is beautiful. This volume is still called ‘Airborne’ but actually covers the 29th Infantry’s involvement in D-Day. I am told that its sequel, part 4 is due out in February 2012. It is refreshing to see that some comic book authors like Jarbinet still invest a lot in research. Many others will also toil a year on creating one album but often riddled with uniforms and weapons errors. Beautifully illustrated and well-researched book explaining all details of the construction of the Atlantik Wall. Also has great tips for sites you can visit when travelling in the area (mainly north Pas de Calais). Part 2 continues where part 1 left off with a trip in a Ford M20 armored personnel carrier through Germany. Part 3 has already been published in French, but I am waiting for it to be release in Dutch around October 2011. This book focusses specifically on the exploits of the British paratroopers and gliders in the night before D-Day. Nice drawings and well researched. 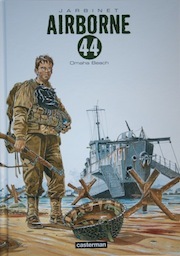 This book covers the Normandy landing, its preparations and the aftermath, seen from the perspective of a 101st Airborne paratrooper and a soldier of the German coastal defense. It’s hard to do these great events justice in just 34 pages, but the additional 12 pages of educational/historical dossier with much more text and photos compensate for this. This book is actually a reworked reprint of the book you see pictured next to it which was first published in 1991. It can be summarized as the comic book version of the well known Hollywood epos Battle of the Bulge, attempting to weave all well-known events into one coherent story. It makes for an interesting overview though. A nice history refresher course. Sequel of the first album described below. This album was covered in a blogpost on November 11, 2009 . The story follows a trooper of the 505th PIR through the woods in the snowy Ardennes. It’s a war and love drama, and certainly on of the best airborne related comic books I have seen so far. I hope that this series will continue after part 2. Based on the actual experiences of Alan Ingram Cope. He was 20 years old when he set foot in Europe in February 1945 after training as a tank driver. No paratroopers, but I have to list these books here because they are the best WW2 comic books I have read so far. Even though not much happens in terms of flying bullets (this was the last year of the war), the more philosophical side of the story of a young man going to war is very interesting. Must-have comic book series even if you are not into war-related books. Part 1 covers the departure from America and the trek from France to Germany.. Beautifully drawn and written surrealistic story of a 506th PIR in the snowy hell of the Ardennes. This album is related to one of Comès earlier works ‘The Shadow of the Raven’ about a German soldier in WW1.